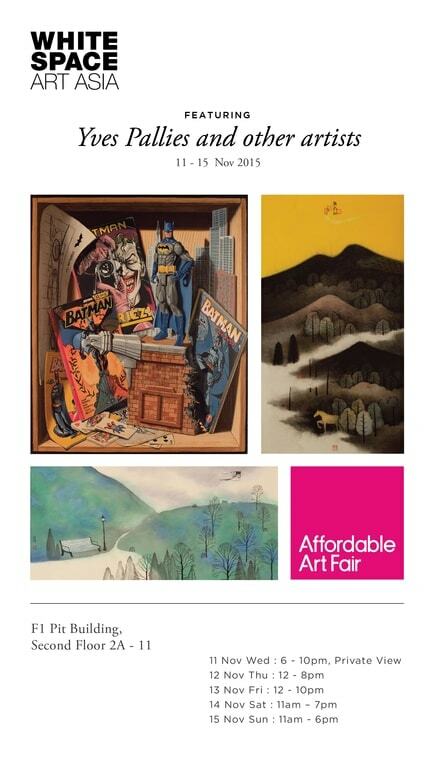 Save the date because White Space Art Asia will be at Affordable Art Fair 2015 and we have something special in store for you. Works from Huang Hong Tao, Liu Li Ping, Miquel Salom, Tang Kok Soo, Wang Yan Hui and Yves Palliès will be exhibited at Booth 2A-11. Huang Hong Tao’s Nameless Hills series was born from his emotional attachment to the rolling hills of the Heilongjiang region where he grew up. In fact, there are no real mountains to speak of, just hillocks and mounds that do not possess the elevation to lay claim to a name. Liu Li Ping’s works explore the mystery of the final frontier on our blue planet. Its immensity is matched by the complexity of the many forms it takes – at times tranquil and calm, it can just as quickly demonstrate awe-inspiring power. The objective of Miquel Salom’s open project is to try to reveal, throughout spiritual and emotional energy, the dual relationship of humans and the universe, using love as a connecting energy between their soul and their destiny. Tang Kok Soo approaches watercolour with an emphasis on individual expression and creativity rather than the more traditional approach of in-situ nature study. His works are created as a result of Tang’s obsession with clean, harmonious composition. Wang Yan Hui’s Memories series is done in green and grey tones, conjuring faded recollections touched by melancholia. He invites us into private, intimate moments, leaving us guessing as to the thoughts of the unseen occupants. Yves Palliès has the uncanny ability to find the most eclectic of subjects. His mastery of realism in painting, the humour present in the title of each painting, as well as the artist’s slightly dissimulated signature – to the extent that looking for it quickly becomes a source of entertainment – all combine to encourage the observer to dream.